Pepukaye - Pep - Bardouille is a Senior Energy Specialist with the International Finance Corporation (IFC), part of the World Bank Group, where she leads several projects related to energy access, focusing on developing and helping to scale-up innovative, commercially-viable business models to extend electricity to the base of the pyramid. She has also penned a number of thought-pieces on the topic, including “From Gap to Opportunity: Business Models for Scaling Up Energy Access” (IFC, 2012) and “How a New Breed of Distributed Energy Services Companies can reach 500mm Energy-poor Customers within a Decade” (with Dirk Muench, 2014). 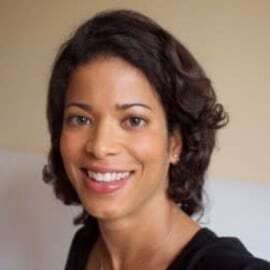 Prior to this role, Pep was a Young Professional with the World Bank and Investment Officer with IFC’s Infrastructure Department, and before that spent 7 years in management consulting with McKinsey & Company based in Copenhagen and London, where she worked across 20 countries serving top teams from blue chip companies in the power, oil, gas and mining sectors and leading public sector entities on strategy, organizational design and operational improvement. She began her career with the United Nations’ Development Program in New York, where her interest in the energy-sustainability nexus emerged.